White is Nigel Davies. His mobile phone rings. The arbiter rushes over and realises that the ringtone is a piece of elevator music by Ray Lynch. He sits arm-in-arm with Nige listening to the syruppy chimes while the tournament hall rapidly empties. White's flag falls. (c) the BCF rulebook covering such incidents went up in flames (and then out the window). John Healy sent the game and position to every chess publication in the English-speaking world, claiming he'd just flattened Anand ... and everyone believed him. DR - actually David Robertson or just pretending? why does the John Healy issue upset you so? I'm not at all upset, I'm just bored at "work". But if you persist in highlighting positions from (allegedly) his games, you might be interested in the occasional good move played by some more weak club players I know. But then, what would be the point? And do you mean this game or another? No-one's near the right answer or players. Who the players are is a secret! If I told you (and especially if I told you as well the year in which they played) then the clue would be too good :) Which in itself, I suppose, is a clue, but just not a very good one. Might be good enough if I speculate that that isn't a queen that's being represented by the queen symbol. Nor the bishop a bishop. Alu - I think many people are aware that Healy was neither a strong player nor an entirely reliable witness. However, he wrote what many people have found an interesting and moving book, and as for his chess - if we were only interested in strong players here, we would have to write rather less about ourselves. But, you know, elephants and gnats. The queen is a queen, the bishop a bishop, and modern rules of chess apply . 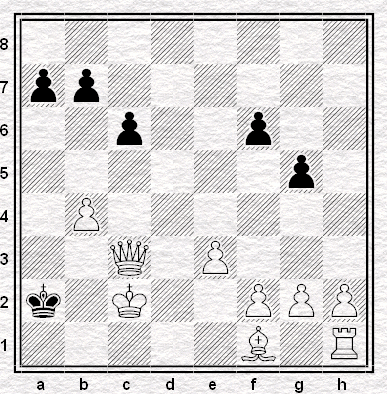 . .
White resigned because his opponent was a military dictator. It's good, but it's not right. I think you've missed the point of the Grass Arena series. Be that as it may, you are welcome not to read them, or any other posts on this blogfor that matter. It was, in fact, from one of the earliest World Computer Championships (early 70s?) And what happened from here is that the machine "playing" the white pieces actually managed to LOSE from the diagrammed position!! Oh anonymous! How you've spoiled my fun. Indeed you're right. The full story of the solution will be published on Monday next week. Only just noticed this but recognized immediately. Did you get it from The (Even More) Complete Chess Addict? Nope - from a book about computer chess. The game in question is from a book by Alex (?) Bell regarding Computer Chess in its early days before Fritz, Rybka and alike came along and beat the GMs!! I remember reading that at my Uni library many many moons ago! We have taken much from Richard James' work in the past. E.g. the practice of naming a series of posts with Roman Numerals (often abbreviating to initials e.g. WHN? IX) was inspired* by the Fox and James column in Chess magazine. That's not the Alex Bell who use to teach at UNN?